he village is the creation of its bridge over the Tay and the railway. Across the river from the station, the Victorian bourgeoisie built solid stone mansions in which to spend their holidays and retirement. This village appropriated Strathtay as its name and was considered a most healthy spot sited by a finely foaming stretch of the river now much used by canoeists. Grandtully is a misspelling, so is Grantully Castle a mile upriver which at least is true to pronunciation. The Gaelic garan-tulach, the hill of the thicket, became Gairntully in English and then slithered still further. 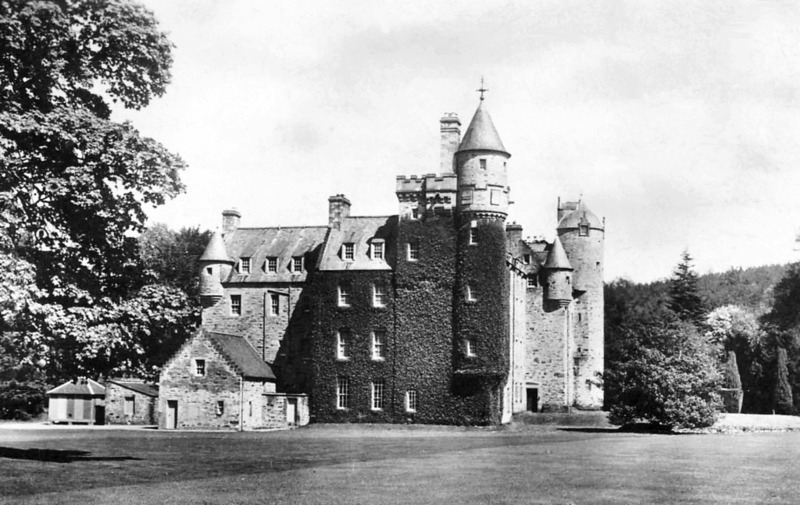 The castle, in private hands, dates from the late 1600s but doubled in size early this century. Its predecessor was nearer the river but the proprietor of Clochfoldich used to pot arrows at his neighbour from the opposite bank. After losing an eye, the laird shifted his castle out of bowshot. The castle was the headquarters to any army, Jacobite, Royalist, Williamite or Cromwellian that was occupying the strath. Sir John Stewart, laird at the time of the rising of 1715, entertained the Pretender at his house in Dundee for which crime he was fined £10,000 by the government. Although the Jacobites recruited a company from his lands in 1745, this was enough to ensure his successor kept out of Scotland and out of trouble.